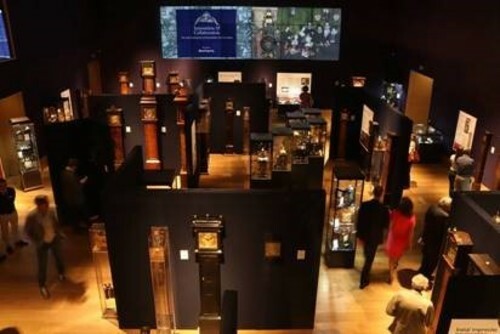 The Innovation and Collaboration Clock Exhibition at Bonhams 101 New Bond Street has now opened and will be receiving visitors until Friday September 14. Two private clock collectors have collaborated to stage this outstanding exhibition of early English clocks at the prestigious venue. This is a short window of opportunity to see all these magnificent clocks and watches and witness over one hundred working objects housed together for the first time. Looking at the age of each exhibit collectively, the clocks and watches on display have kept time for over 39,567 years. To put that into context, 39,567 years ago saw the Upper Paleolithic period, more broadly known as the late Stone Age. If you’d like to see what 39,567 years of clocks looks like, visit Innovation and Collaboration to find out. After all, what could be more important than time itself? The exhibition also features third party loans, including contributions from the Science Museum, the Clockmakers’ Company and the Collection of the 5th Lord Harris from Belmont House, amongst others. The exhibition - which also includes watches and documents - explores five themes that analyse the story of clockmaking. Subject matter ranges from initial imprecise timekeeping through to the highly accurate timepieces of great mechanical complication, along with crown patronage and the luxury market. It also includes time-keeping pieces made for the newly emergent middle classes, showing the diffusion of aspirational goods to the middle classes during the post-Restoration economic boom. Dr John C Taylor OBE, one of the exhibition’s contributors, will be available for interview, by prior appointment. High resolution images are available on request. Media information provided by Famous Publicity. For more information please contact Hetty Smyth at hetty@famouspublicity.com or Tina Fotherby at tina@famouspublicity.com or Mary-Jane Rose at mary-jane@famouspublicity.com call 0333 344 2341. This press release was distributed by ResponseSource Press Release Wire on behalf of Innovation & Collaboration Clock Exhibition London in the following categories: Men's Interest, Entertainment & Arts, Leisure & Hobbies, Home & Garden, Women's Interest & Beauty, Education & Human Resources, Manufacturing, Engineering & Energy, for more information visit https://pressreleasewire.responsesource.com/about.